Text & Photographs By Michael J. Kelly © All rights reserved. With a brief sputter and a whir of the rotor blades, we picked up speed and hurtled down the runway. Within a few seconds the Pilot and myself, the sole occupants, were airborne in what can only be described as a hang glider with an engine. With no cabin or windows to protect us, we breezed through the warm African air on our way to the world's largest sheet of falling water, Zimbabwe's legendary Victoria Falls. 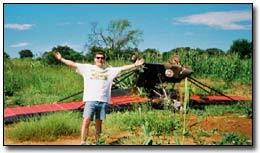 I was enticed to Zimbabwe by a long list of attractions. 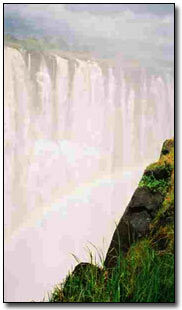 The scenery, the chance to go on safari, the chance to do the world's highest freestanding bungee jump. 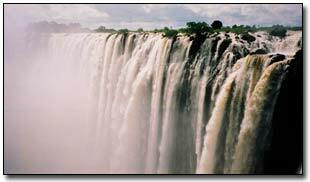 But above all was the opportunity to see the famous Victoria Falls. I remember being overwhelmed by the awe-inspiring power of Niagara Falls years previously, and being astonished to hear of the African wonder that was even more impressive. This I had to see for myself, and what better way than on a joy-ride flight over the Falls? "What the hell is that?" I demanded. 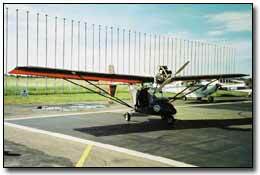 Instead of the Cessna-type aircraft I had envisaged, I was faced with what looked like, and more or less was, a hang glider with a lawnmower motor shoved in the cockpit and a wooden propeller stuck on its nose. 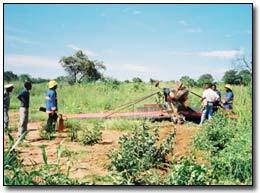 I learned that this seemingly "Do It Yourself" flying contraption (officially known as an "Ultra Light") is very popular in Africa. Apparently farmers with large land areas to cover use microlights extensively for crop spraying and general farming. In for a penny, in for a pound, (and fairly certain the thing would never make it off the ground anyway), I clambered aboard. After a short runway launch we actually become airborne. Gaining altitude we banked to the North and suddenly "The Smoke that Thunders" (the literal translation of Victoria Falls' African name) came into view. Although too far away to hear its roar, the first part of the name certainly rang true. Even from six miles away we could see the enormous mist clouds rising high into the sky, the sole obstruction in a view that went clear to the horizon in every direction across the African plain. I was struck by the "flatness" of everything. There were no mountains to obscure any view, and it seemed as if the whole landscape was simply converging into the plughole that was Victoria Falls. Being in Africa, I expected to see herds of animals charging across the green and brown earth, yet all was still. No people, no animals, just empty scrub as far as the eye could see. It was only later I realized how little the untrained eye sees of this apparently desolate landscape. Just as I was starting to enjoy myself, the Pilot insisted that to really experience the feeling of flying over Africa I needed to take the controls and pilot it myself. I considered for a moment exactly what I would be taking control of. No roof. No windows. No beer to indulge in if it all goes horribly wrong. Basically, the lack of most components of an aircraft that I would normally deem essential. I declined offer with a nervous laugh, and another click of the rosary beads. Little did we know that the scene of our light-hearted banter was about to change dramatically. The pilot had just merrily accepted my decision not to take control when a sudden explosion came from the front of the aircraft. The engine cut.. and silence. The silence progressively turned into a high pitched whine as the plane began to pick up downward speed. Assuming this was part of our earlier conversation I waited for the Pilot to burst into convulsions of laughter at such a hilarious joke while restarting the engine. As he turned to me his facial expression killed any remaining doubt about our new circumstances. "We are in an emergency situation, please remain calm". These words, followed by his "Mayday Mayday" call into the radio sent a cold chill down my spine and through my bowels. We were flying at 100 miles per hour and one kilometer above absolutely desolate scrubland the only propeller had just blown off and the engine was dead. Either time slows down in an emergency, or my brain went on temporary holiday. It seemed to take an age for me to realize that this was actually happening. No joke, no dream, no trial run. It very gradually dawned on me that I was about to die in the African bush, or at the very least be confined to a wheelchair for the rest of my life. I began to breathe deeply and tried to relax as much as possible in the hope that the impact on a relaxed body would minimize the injuries. I tried to prepare for the pain that would come from broken limbs, and tried not to think about the potential burns. Suddenly life rapidly picked up pace again, moving from slow motion to fast-forward in a split second as I realized that time was about to run out. I could see the ground starting to pick up speed as it came hurtling towards us. Three seconds to impact and the pilot let go of the controls as we both assumed crash positions. The collision when it came was straight out of Hollywood. A jarring smack, followed by the whipping sounds of scrub tearing at the minimal framework that protected us. It seemed as if the scrub was greedily trying to reach in with its vicious limbs to rip us apart before some other cruel feature could claim us for itself. Our speed didn't drop as we waited for the final impact with the inevitable "immovable object". Then came the dull thud, the final act to put an immediate end to our fears. I braced myself for the final scene, and…. Silence. More unnerving than screams or cries. Even more alarming than the scrub trying to tear us to pieces. I suddenly realized that the plane had stopped and I was intact. A quick check with the pilot confirmed that we were both miraculously uninjured. The celebration lasted seconds and was abruptly brought to a halt by the Pilot's rapid instructions to get out, as the plane was about to blow up. This was confirmed by the liquid running down the back of my neck that I originally assumed was blood but now realized was petrol. A tip now for all intrepid travellers: never get into a harness without knowing how to get out of it! As the panic began to rise in my stomach I fiddled with the buckles to try and escape the impending inferno. Eventually figuring out the harness, I quickly remembered something else too late. I had been hanging upside down, six feet above the ground. What goes up must come down, and landing face down on the roof I sustained my only real injury of the accident, a slightly bruised knee. Having crawled out of the cockpit and put a safe distance between the broken mess and ourselves, I was still having trouble understanding what had just happened. The sense of displacement from reality was only heightened by the arrival of an entire tribe from the middle of nowhere to investigate today's drama. Complete with children and even their "Head Man", this apparition seemingly out of nowhere completely dumbfounded me. I looked out across the bush towards the mist rising high from our destination. 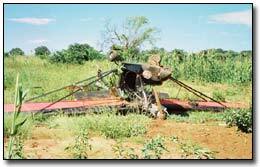 I thought of the film "Out of Africa" where Robert Redford died in a plane crash. Yet I had survived what Redford couldn't. I waited for God to open the heavens and show me the light. Would I be shown Nirvana, Tao, the meaning of life? The clouds parted, the wind picked up, but salvation came in a different form. A fire truck crashing thought the bush to collect us and bring us back to civilization, beer, and a promise to never skip lunch again!